Tireless Volunteer. Quality Crusader. Legendary Studio Mastermind. Standards Activist. Academy Award Winner. These are just a select few characters starring in SCN’s 2017 Hall of Fame. They are perpetual tinkerers, questioners, value drivers, brilliant engineers, bold thought leaders, mentors, and cumulatively, they make up the rich fabric of this industry we know and love. Among the 2017 honorees, we find determination to overcome skeptics, winning respect with intellect, those that relish mentorship and persevere in the face of business forces beyond their control. The Hall of Famers built names for themselves by doing good work and getting called back for more work in return. They’ve recognized when there’s a hole in the market, where there’s demand for a new solution, and they tackle the opportunities and inherent risks with vigor. As we profile this year’s honorees, these are some of the common themes we can trace throughout the professional and personal stories of these inimitable leaders. 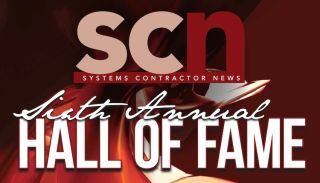 In this sixth installment, we’ve chosen to evolve the recognition beyond integrators and consultants, to include inventors and other key business leaders, because it’s all of these vital contributors who have furthered our accomplishments, singularly and collectively. Throughout this process, we’ve used these pioneering stories in reconsidering the meaning of success. It’s a worthy topic for the industry at large to ponder as we carve out our place in the rapidly shifting technology landscape we face in 2017. We hope that through their stories of triumph over the course of their lives, the diverse qualities that led them to succeed are illuminated. They are intended to inspire active and nascent tinkerers alike to reflect. The varied lessons presented set the tone for the rest of us to create goals toward reaching new levels of achievement, ultimately building an even brighter, more wonder-filled future.